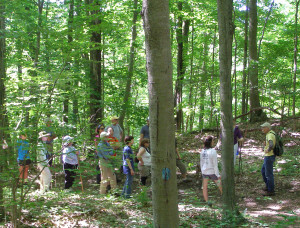 Saturday, June 7, the day of the Land Trust’s Connecticut Trails Day hike, was sunny with a gentle breeze and not hot or humid, a perfect day for a walk in the woods. Twenty folks, including co-leaders Bill Horne, Meg Kilgore, Bill Leece and Joan and Harry Merrick came from Branford, North Branford and Hamden and met at the parking area at the end of Laurel Hill Road at the entrance to the Town’s Pisgah Brook Preserve at the north end of town. The approximately ninety minute walk crossed Pisgah Brook and climbed to the top of Saltonstall Ridge, which is part of the Metacomet Traprock Ridge system that runs through Connecticut from Long Island Sound into Massachusetts, then circled back to the starting point. 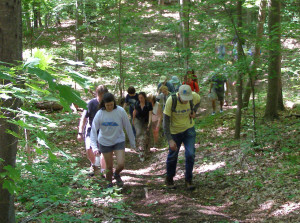 The hike was part of Connecticut Forest & Park Associations’s 22nd Annual Connecticut Trails Day celebration of Connecticut’s open space and hiking trails, one of 258 events statewide. BLT has led hikes on CT Trails Day for more than fifteen years, introducing people from Branford and nearby towns to Branford’s many natural areas and hiking trails.